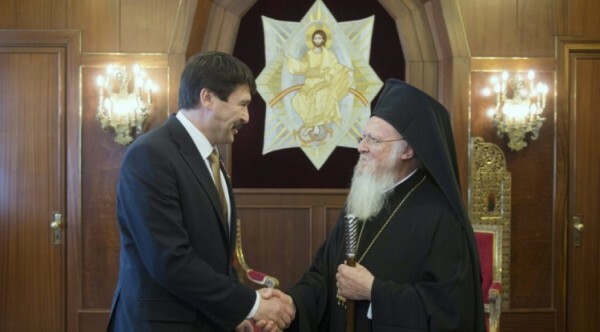 International issues and environmental protection were at the focus of talks between Hungarian President János Áder and Ecumenical Patriarch of Constantinople Bartholomew I in Istanbul on Saturday. The President and his entourage met the Patriarch of Constantinople on the final day of their four-day visit to Turkey. Informing the state news agency MTI of discussions, László Szőke, director of foreign relations at the Office of the President of the Republic said that according to the religious leader who is known for his commitment to environmentalism, the challenge posed by climate change is not only an economic and political but also a moral problem. “Those who fail to respect nature also commit a sin against the Creator of the world”, Bartholomew I said at the meeting. The meeting follows the conclusion of an agreement between the Hungarian government and the country’s Orthodox churches last year. The Patriach praised the agreement at the meeting, which includes that the cabinet has high esteem for the Orthodox tradition, which has been part of Hungarian history for centuries. 15 000 Hungarians reported that they belong to the Orthodox church in the 2011 census.